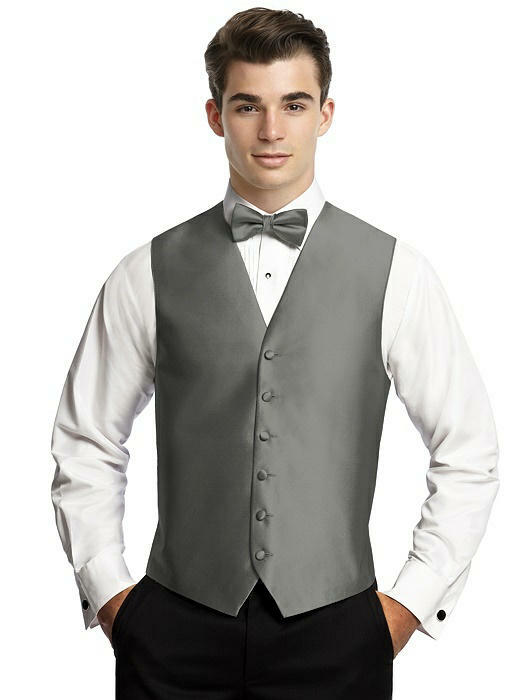 Men's 6-Button Tuxedo Vest by After Six. Our yarn-dyed jacquard 6-button tuxedo vest is a polished addition to your wedding ensemble. The weave of the fabric creates a luster and sheen for a classic look at an affordable price. We've created these elegant men's accessories in our most popular colors so that each member of your wedding party will complement your wedding palette. Colors with white lining &amp; back: White, Ivory, Frost, Palomino, Cornflower, Fuchsia, Clementine, Buttercup, Clover, Spa, Firecracker. Colors with Black lining &amp; back: Oasis, Platinum, Charcoal Gray, Sapphire, Black, Midnight, Espresso, Persian Plum, Regalia, African Violet, Flame, Moss.